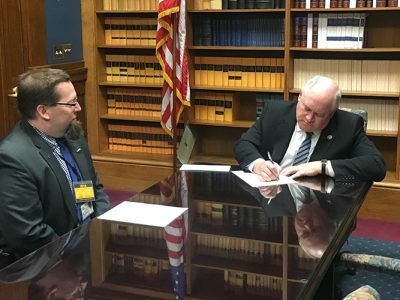 (Topeka, Kan.) – Today, U.S. Rep. Ron Estes filed for re-election to Kansas’ 4thCongressional District with the Kansas Secretary of State’s office in Topeka. Estes was first elected to Congress in the April 2017 special election to fill the seat held by Mike Pompeo. “I’m proud of what we’ve accomplished over the past year and I am excited to build on our success. The results speak for themselves. Our economy is growing again, wages are increasing and deregulation is liberating our state’s innovators. Keeping this seat, and Congress, in Republican hands will secure these gains and produce even more benefits for Kansas families,” Estes said. Since Estes was elected he has helped pass landmark tax reform, fought to roll back burdensome regulations, helped lead the effort to reform our nation’s broken immigration system, defended Wichita’s aviation industry from so-called air traffic control privatization plans and stopped the Department of Homeland Security from conducting chemical testing at the Chilocco Indian School near Arkansas City. Rep. Estes has also established himself as a national leader in Congress. In his first year in office he’s been published in several national publications, including twice in the Wall Street Journal. He’s done this while returning home to Kansas each week where his children attend school. Rep. Estes has earned the respect of his colleagues as a hard-working servant leader. Rep. Estes has also earned a reputation for providing excellent constituent service. He has assisted countless Kansans in navigating the federal bureaucracy and helped one constituent get home from South Africa in time for his friend’s funeral. He has also held extensive constituent meetings, listening tours and telephone town halls. Outside organizations have also recognized the excellent work Rep. Estes has done since joining the 115th Congress. He recently received the U.S. Chamber of Commerce ‘Spirit of Enterprise’ award for his support of small and local businesses, the Aircraft Owners and Pilots Association ‘Freedom to Fly’ award for his support of general aviation, the American Conservative Union ‘Award for Conservative Excellence’ and received a score of 77 percent from the Heritage Foundation – the highest score in the Kansas delegation. Rep. Estes starts off the 2018 campaign poised for re-election. He raised over $250,000 in the first quarter of the year for his campaign and joint fundraising committee and has over $450,000 cash on hand. This comes after Estes raised over $1 million in 2017 for his campaign and joint fundraising committee combined. “My work in Congress is just getting started. Kansans need us to keep moving forward and not return to the failed policies of the Obama-Pelosi era. Today, our economy’s growth rate is approaching three percent, which is nearly twice the growth rate under President Obama. Unemployment is at its lowest level in nearly two decades. And more than 400 American companies have increased hiring, boosted wages, given bonuses or increased benefits since tax reform became law,” Estes said.